The beverage giant has its eye on teens as it strives to achieve its latest goal of 2020 Vision, an initiative that calls for the company to more than double system revenue to $200 billion, as well as servings to more than 3 billion per day by the year 2020. To make this 2020 Vision a reality, Coke is targeting teens with its largest teen-focused campaign to date, Coca-Cola Music. Advertising Age reports that the company plans to take the global music campaign to more than 100 markets, especially the six markets of China, the U.S., India, Indonesia, Nigeria and Pakistan who will have half of the teen population by 2020. By 2020, 2.5 billion people, or one-third of the world’s population, will be younger than 18. Over the next decade, there will be 31 million teens in the U.S. Coca-Cola needs this massive teen market to achieve its 2020 Vision. Coca-Cola has been focused on making its efforts more global in nature, so Coca-Cola Music will resonate universally. The musical effort will begin in late-March with “24hr Session” which will involve 20 markets. 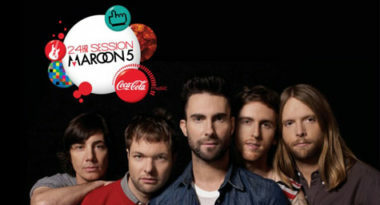 Maroon 5 will escape to a London studio for 24 hours and emerge with a new original song. Fans will be able to share their opinions and ideas with the band, and an interactive projection system will allow fans’ comments and photos to be streamed into the studio. Coca-Cola has also partnered with One Night Only, an up-and-coming U.K. band, and Taio Cruz, a British singer and songwriter. The band has written and recorded a new track which includes Coca-Cola’s signature five-note melody called “Can You Feel It,” which will become the soundtrack for a new global spot from Wieden & Kennedy, Amsterdam. Mr. Cruz will be working on a track with artists selected by teens in various markets. “Our success in growing our sparkling category today depends on our ability to grow and connect with teens, the generation of tomorrow,” said Coca-Cola CEO Muhtar Kent. With Coca-Cola Music, the company is reaching out in a way that should strike a note with teens all over the world.